A liquid, strongly alkaline, mildly foaming industrial cleaning agent, suitable for removing very stubborn deposits of oil or grease, soot, old layers of floor wax, and protein compounds from all alkali-resistant surfaces. Effective against: Floor wax; Grease ; Oil; Animal or Vegetable fats and oils; Tire marks on hard floor surfaces. Slaughterhouses and Butcher Shops: for removal of animal fats and oils, as well as other protein-based soiling. Floor surfaces on which wax has been applied: Old wax can be stripped from the floors using CombiActive, in preparation for recoating. Engine and chassis repair or maintenance: For removing old, caked grease and oil from engines, transmission casings and axle housings to make maintenance and repair more efficient. Workshops: To remove oil and grease stains from hard floor surfaces. Strong formulation for more efficient action reduces detergent use and saves costs. 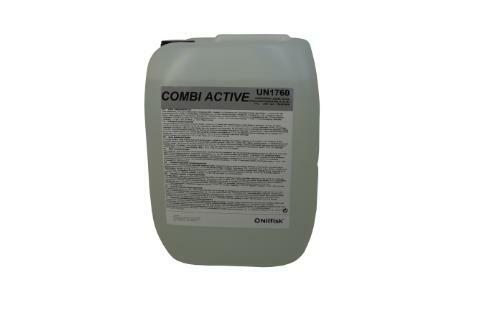 Contains agents to reduce or eliminate the formation of calcium or corrosive deposits in the machines using CombiActive, so equipment maintenance costs are reduced. Highly biodegradable for easy disposal. Can be separated from the waste water in treatment equipment, simplifying waste water disposal or treatment..
High Pressure Washers: Fill the detergent container of the machine, and adjust the detergent injector for between 1 and 10%, depending upon the strength of the soiling. Floor Care Machines: For ‘Maintenance Cleaning’, dilute the CombiActive between 1:10 (10%) and 1:20 (5%) in the solution tank of the machine. For “Heavy Cleaning”, dilute between 1:3 (33%) and 1: 10 (10%). Pre-Spraying: For most applications involving Pre-Spraying, dilutions between 1:10 (10%) and 1:50 (2%) will be correct. Use sprayers made of PP or PE material. Hand Cleaning methods: Wear skin protection, like gloves, and dilute the CombiActive to between 1:10 (10%) and 1:100 (1%) depending upon the strength of the soiling. If brushing is required, a nylon brush is recommended. Since CombiActive is a strong detergent, we strongly recommend testing your final solution on a small area of the items to be cleaned before general application. Do not use CombiActive on painted surfaces or on non-ferrous metals like aluminium, tin, zinc or brass.